"The best strategy for winning at Craps. 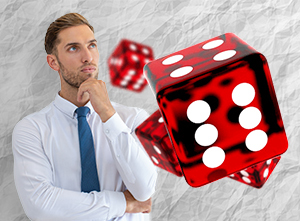 Use the following information to increase your odds to win money playing craps at land-based and online casinos." The first roll of the dice is called the "come out" roll. If you roll a 7 or 11, you win. If you roll a 2, 3 or 12, then you have rolled craps and you lose. If you roll any other number it becomes the "point". The purpose of the "come out" roll is to determine the point, which can be either 4, 5,6,8,9 or 10. There will be a puck marked "on" above the point number printed on the table. The goal of this game is to throw the point again before throwing a 7. Rolling a 7 after the point is established is an "out 7". If you throw the point, you win and the round is over. If you throw an "out 7", you lose. If you throw something else, you keep throwing until you get the point or an "out 7". This bet is placed on the "pass" line before the "come out" roll. This bet wins at even odds 1:1. You win if you roll 7 or 11 on the "come out" roll, or if you later roll the point. You lose if you roll 2, 3 or 12 on the "come out" roll, or an "Out" 7 on later rolls. This is the opposite of a "pass" bet. You win if the "come out" roll is craps (2,3 or 12), or if a later roll is an "out" 7. You lose if the "Come out" roll shows 7 or 11, or if a later roll is the point. These are like "pass/don't pass" bets, except that they are placed during a round. The same rules apply. You win if the next roll is 7 or 11 and you lose if it's craps. "Come-out" roll "pass line/come" "don't pass/don't come"
You bet that the next roll will be a specific number. These include 2,3,7, 11 and 12 bets, the Any Craps bets, the Field, Hop and Horn bets. The way to improve these bets is by either "buying odds" or "laying odds". These bets are placed in addition to your first bet, after the Come Out Roll. They improve your first bet because the house doesn't take any edge on Odds. You're just betting on the dice. Most casinos only pay in $1 dollar increments. You will lose anything less than a dollar. If you "lay double odds" at $10 and get a 3-2 payout, or 6 - 5 in particular, you will lose everything less than $1, since you can't divide multiples of 10 by 3 or 6. On the 5/9 point you could lose $.67. This may not be a lot, but why give the house anything. So, try a $6 bet instead of a $5 bet, making the Double Odds bet $12. Bet placed after a Point is established (placed in "Pass Line" bar after a Pass Line Bet has been made). Bet placed after a Point is established (placed in "Don't Pass" bar after a Don't Pass Line Bet has been made). A "Big 6" Bet is a bet that 6 will be rolled before 7; a "Big 8" Bet is a bet that 8 will be rolled before 7. The bet is placed in either the "Big 6" or "Big 8" box located in the left corner of the craps table. This bet wins even money. Unresolved bets may be removed. Winning bets payout according to the following ratios: 7-to-6 on numbers 6 and 8, 7-to-5 on numbers 5 and 9, and 9-to-5 on numbers 4 and 10. Place Win Bets are inactive during Come Out Rolls. The markers are removed after the Come Out Roll since all Place Bets will be active. Unresolved Place Bets may be removed. Winning bets payout according to the following ratios: 4-to-5 on numbers 6 and 8, 5-to-8 on numbers 5 and 9, and 5-to-11 on numbers 4 and 10. Win when the roll is 4, 5, 6, 8, 9, or 10 before 7 (bet covered with a "BUY" marker). The bet is covered with a "BUY" marker to distinguish it from a Come Bet. A commission charged when placing a "Buy" Bet and the winnings are paid at true odds: 6-to-5 on numbers 6 and 8, 3-to-2 on numbers 5 and 9, and 2-to-1 on numbers 4 and 10. If a "Buy" Bet is lost or removed, the commission is returned. Buy Bets are inactive during Come Out Rolls, an "OFF" marker will cover your Buy Bet to indicate that is inactive. The markers are removed after the Come Out Roll since all Buy Bets will be active. Unresolved Place Bets may be removed. The bet is covered with a "LAY" marker to distinguish it from a "Don't Come" Bet. A commission is charged when placing the "Lay" Bet and the winnings are paid at true odds: 5-to-6 on numbers 6 and 8, 2-to-3 on numbers 5 and 9, and 1-to-2 on numbers 4 and 10. Lay Bets are active even during the Come Out Roll. Unresolved Lay Bets may be removed. If 7 is rolled, you win 4 times your bet. If 11 is rolled, you win 15 times your bet. If 2, 3, or 12 is rolled, you win 7 times your bet. A Winning Horn Bet pays 15-to-1 on numbers 3 and 11, and 30-to-1 on numbers 2 and 12. Placing a Horn Bet divides your wager by four. A quarter of the bet is placed on each number. When you win, the amount won is a quarter of your total bet times the given odds. Rolling a number by doubles is said to be rolling the number "the hard way." For example, a roll of 4+4 is a called a "hard 8," while a roll of 5+3 or 6+2 is called an "easy 8." A winning bet pays 7-to-1 on numbers 4 and 10, and 9-to-1 on numbers 6 and 8. Unresolved Hardway Bets may be removed; they are inactive during Come Out Rolls.